Parvati, the Supreme Goddess of Power known as sagun form of Devi Adi-Parashakti primarily gives the concept of Nav-Durga Devi. In Reality Nav Durga are the life phases of Maa Parvati. 1. 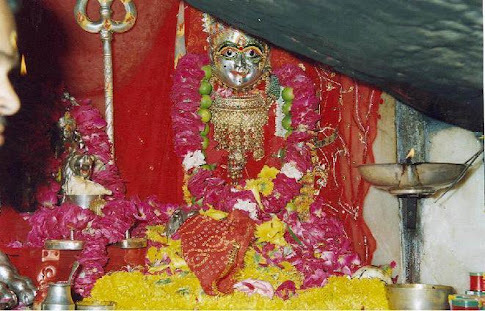 In beginning When Lord Rudra worshiped Maa Adi-parashakti for creation, Lord Rudra cleared different levels of Shakti and Maa Shakti appeared in 'Saguna' form from the left half of Lord Shiva. The Goddess was Siddhidatri. 2. Then Goddess started living inside center of Sun so that Sun liberates energy by the grace of Goddess, the Goddess is known as Goddess Kashmunda. 3. The same Goddess then took birth in home daksha, Goddess was a great sati and her unmarried form is known as Goddess Brahmacharini. 4. After the self immolation of Maa Sati she appeared as daughter of Lord Himalya, the Goddess is then recoganized as Goddess Shailputri. 5. At the age of 16 Goddess Durga was extremely beautiful and very fair complexion and known as Goddess Mahagauri. 6. When Devi gets married with Lord Shiva, as Lord Shiva, Devi also liked to wear half chandra on her forehead, and recoganized as Goddess Chandraghanta. 7. When Devi became the mother of Lord Skanda or Lord Kartikeya, Devi was then known with name Goddess Skandmata. 8. Then Devi took the form of Goddess Katyani to destroy Demon Mahishasura. 9. Goddess Gauri or Goddess Parvati removed Devi's outer golden skin to fight against demons Shumbha-Nishumbha, Devi became very dark Goddess's this form is called Goddess Kaalratri.